It would appear that roasted potato recipes are sought after rather frequently. I get a lot of hits from people looking for rosemary and garlic RRBP’s, a recipe I posted last year. Recently I had a small surplus of them in my house thanks to Brent making a southern dish that he likes. My New England roots don’t care for that dish too much, but I did want to make use of the leftover potatoes hanging around. So I checked the fridge to see what I had to work with and this recipe is the result. 1. Wash potatoes, pat dry, and cut into quarters. Toss in butter and 2 tablespoons of EVOO and place in a baking dish in a single layer. Bake in a 400 degree oven for 30-35 minutes, giving a toss halfway through. 2. In a small bowl mix together mustard, thyme, white wine vinegar, and remaining olive oil. Taste and season with salt and pepper to taste. Set aside while potatoes roast. 3. 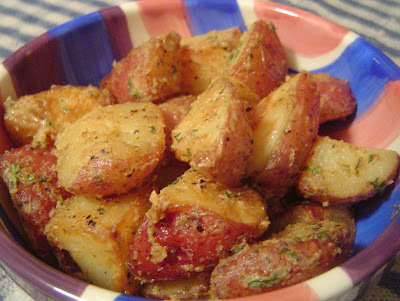 Once potatoes are cooked fork-tender and nicely browned, remove from oven. Transfer potatoes only to a large bowl. Discard any butter/olive oil. Spoon dressing mixture over hot potatoes and toss till thoroughly coated. Serve immediately. Thoughts: I loved them. I wanted more of them. The smell that these have once you toss them in the mustard dressing is AH-mazing and they taste even better than they smell. Mustard and thyme is a great flavor combo and it really compliments the potatoes without overwhelming them. The flavor gives the potatoes the amount of pop to keep you interested and wanting more. These would make a perfect side dish to any steak, chicken, or pork dish. Hi, new follower. Wow, I want to try all the recipes, they all look soooo good. Oh I'm making these this weekend - they sound georgous! POLL: What should I make for dinner tonight?